Recognised as one of Britain’s foremost Batik artists, Buffy Robinson started experimenting with Batik at the age of fourteen while still at school. After several successful exhibitions in the early seventies in the south of England where she was brought up, Buffy moved north to Lancashire. She was immediately captivated by the rugged landscape, sheep and dry-stone walls around her home that have been such an influence in her work. Cut-off from the mainstream of the British Batik world, which was still based in London, she developed her own individual style, constantly trying out innovative techniques with dyes and lighting to achieve subtle effects, and adapting them to create that instantly recognisable Buffy Robinson ‘look’. 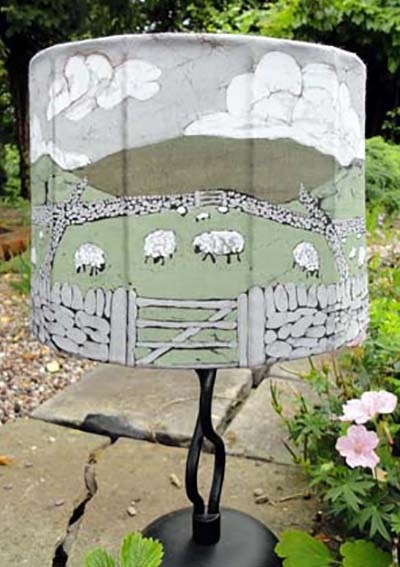 At first Buffy produced her original Batik paintings as window hangings and lampshades which, being back-lit, showed her work to its best advantage. 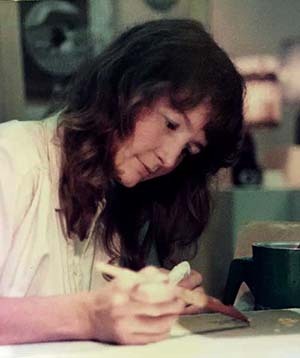 In 1981, by then an established Batik artist, and encouraged by the growing demand for her work, Buffy designed a new and innovative range of products for the giftware market using photographic reproductions of her Batik paintings. 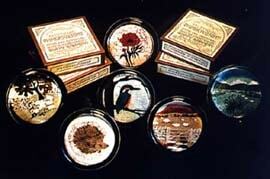 Paperweights and greetings cards were later followed by prints, bookmarks, gift tags and gift boxes. 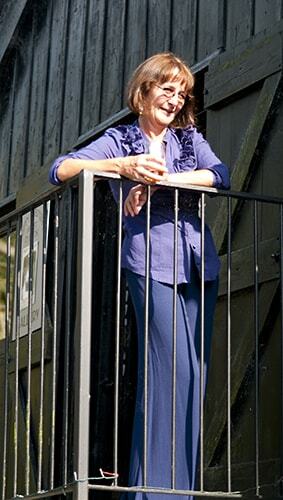 Success was immediate and a steady growth in sales led to the registration of Buffy Robinson as a Limited Company in 1987, selling to over 800 retailers in the UK, expanding into Europe, USA, Australia, New Zealand and Japan over the subsequent years. 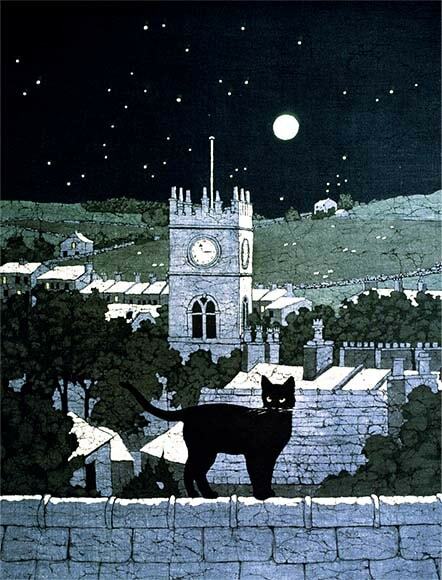 During this time she produced some of her best known work – sheep landscapes, cats, wildlife, waterways and farm animals – the essence of the English countryside. 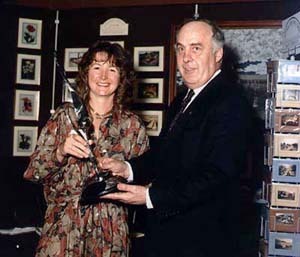 Throughout the eighties and early nineties, the company was a regular exhibitor at trade shows, including the NEC International Spring Fair, Top Drawer and the Harrogate Craft Fair, where in 1989 Buffy’s products, display and sales literature surpassed 900 other exibitors to win the Ted Mahoney Award for Excellence, going on to win it for an unpresidented second time in 1994. In 1988 she was commissioned by the Department of the Environment to produce Batik paintings of the Royal Palaces of London. 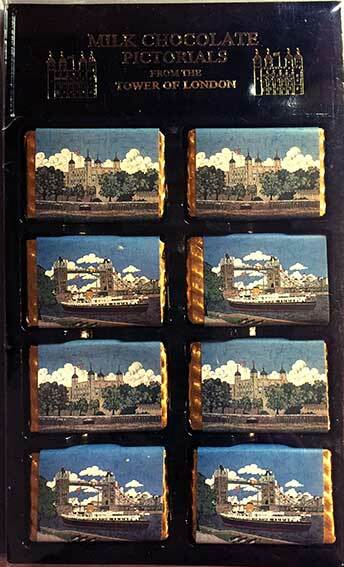 These included the Tower of London, Hampton Court, Kensington Palace and the Banqueting House. She was also asked to create a commemorative painting of the Royal Yacht Britannia. 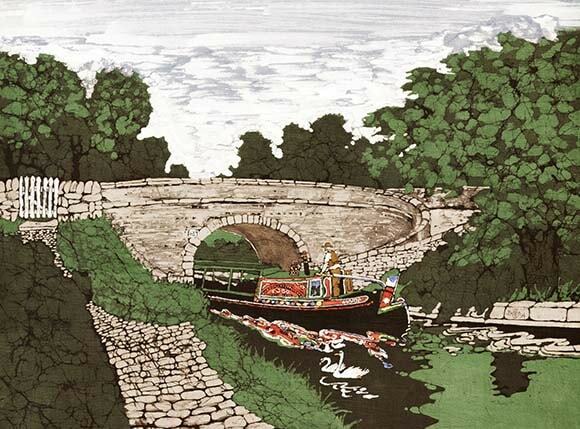 Reproductions of all these paintings were sold as cards and giftware in the palace shops and at Tower Bridge. In 1992 I was commissioned by Marks & Spencer to do an ‘English Country Calendar & Diary, to feature twelve of my ‘country’ designs. This design ‘Cottage Garden’ was the one chosen for the front cover. Early in 2000, Buffy was approached by the chairman of the Inland Revenue to produce a Batik painting of Somerset House, the Inland Revenue headquarters. From this original, which now hangs in the Chairman’s office, she made paperweights for them to give as gifts to visiting dignitaries. This led to commissions for a series of major architectural works depicting many of Britain’s finest cathedrals, castles and stately homes. 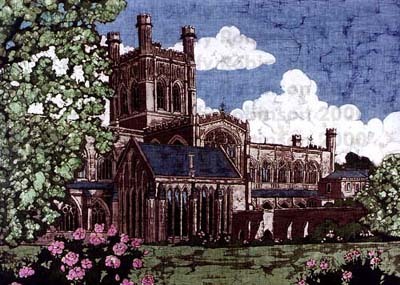 Buffy was commissioned to produce Batik paintings of a number of great English Cathedrals, including those at Canterbury, York, Durham, Worcester and Chester. Cards, prints and bookmarks bearing these images were sold to visitors at all these historic sites. She developed a technique to portray the gothic stonework and detail of these buildings with great sensitivity and accuracy, whilst capturing the atmosphere and grandeur in settings of dramatic skies and textured trees. 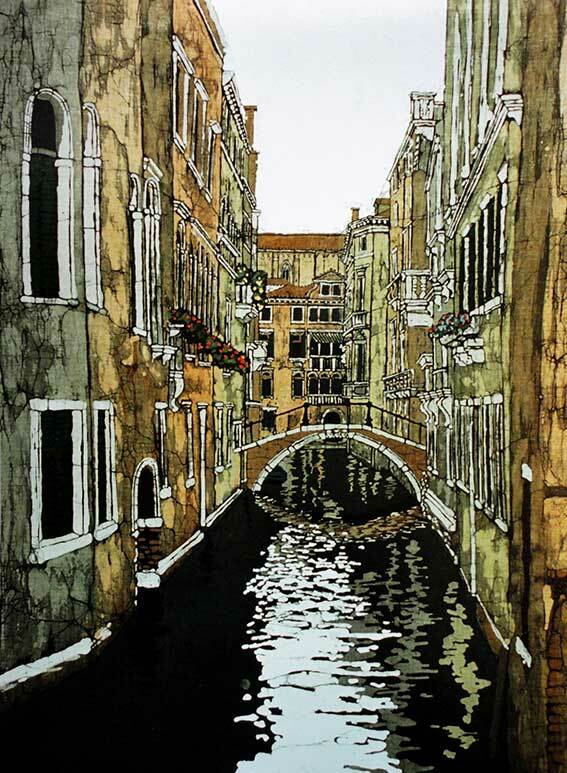 After a visit in the early 1990s, her great love affair with Venice began and her creative work blossomed and developed. In many delightful Venice studies from this time, you can see her use of the Batik medium at its best to show the cracked and crumbling plaster and stonework. Her fine colour sense was inspired on the classic Venetian ochres and terracottas and so also began her endless fascination with reflections. In 1994 she moved her studio to a seventeenth century barn on the banks of the Llangollen Canal in beautiful rural Shropshire. 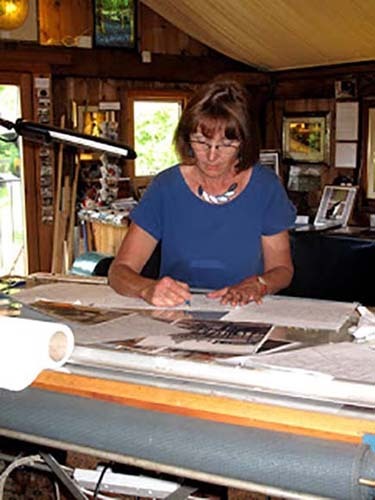 Her interest in canals is evident in her work and here she has a beautiful private canal-side Gallery displaying her work, framed back-lit original Batik paintings, as well as her hand made Batik lampshades, work spanning over fifty years. These days, Buffy works mostly to commission, often inspired to explore new avenues in what she is asked to create. She opens her ‘hidden gem’ of a Gallery, as she says, ‘only on sunny days when the mood takes me’, so if you wish to visit, let Buffy know and you can arrange a time when she will be happy to show you around. Buffy Robinson is a member of the Batik Guild.